FC DELCO: The Best Pathway for Female Soccer Players. Play high school soccer. Play club soccer. Advance to play in college! Hello ladies: at FC DELCO, you can TRULY have it all! You don't have to be restricted to JUST club soccer. You can play high school soccer and even play other sports. 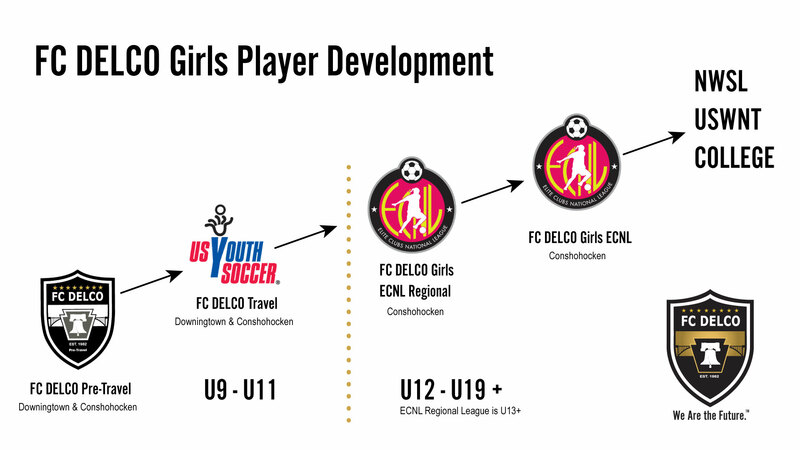 At FC DELCO, our top U12 team and top two girls teams, ages 13+ play in the ECNL and ECNL Regional League. As a result our players get greater access to the best competition in the region, which ultimately improves their development. The ECNL Regional League is actually new. You can read more about the ECNL Regional League here. It's NO WONDER 100% of graduating seniors on our top Girls ECNL team are committed to play soccer at top NCAA programs around the country. See where they're headed! All of these fierce young women have had the opportunities to excel at the club level AND in high school sports, rising as leaders on their teams and as individuals. We can only imagine what they will go on to accomplish--and we're excited to see it! Join us! Click below to register for our 2019/2020 tryouts, which start Monday, April 1st for girls in the rising ages of U12+. Got questions? Please contact our Girls ECNL Director, Zac Tassone.